Between our subfloor platform and the log wall is a plate, like with a stick-framed wall. It's known by names like bottom plate, sill plate, sole plate, wall plate, floor plate or raising plate, or just plate, sill or sole, depending on your region and whether you come from a conventional or timber frame construction background. Installing the mud sill plates over the foundation stem wall was our first real experience with boring holes for the vertical through-bolts. Now it was time to refine the process because we will be doing a lot of it. 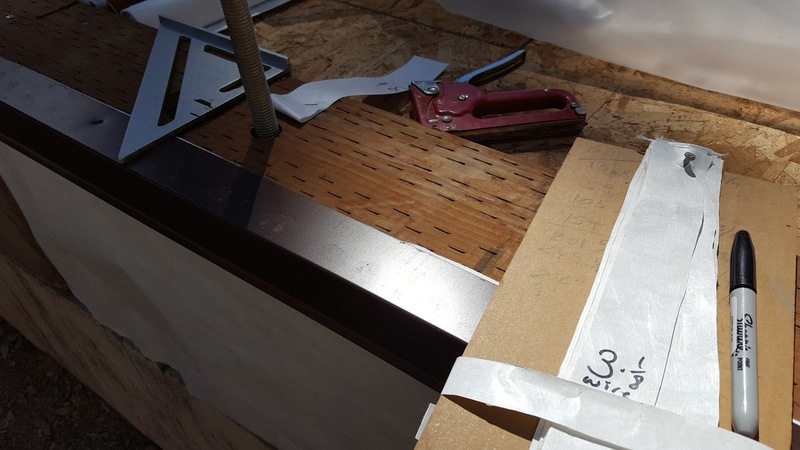 The spacing and alignment of the bolts were inexact, so every hole had to be measured off the bolts and marked on the treated lumber. Like with the subfloor sheets, each hole needed two measurements. 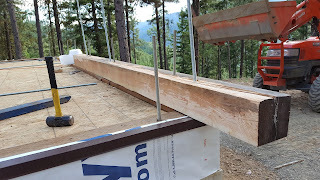 The linear measurement was from bolt to the end of the previously installed piece of lumber. The perpendicular measurement was from the outside edge of the subfloor to the center of the bolt. We installed sill seal above and below the plate to help with insulation. Sill seal is a rolled foam product that comes in widths to match 2 x 4 or 2 x 6 lumber. It’s faster than applying a tube sealant and provides better coverage. The solid log wall weighs somewhere around 170 pounds per linear foot, so the foam will be thoroughly compressed. The bolts set in the foundation stem wall will end above the second course of logs, topped off with a bearing plate washer and a nut. Parallel to these bolts I started a whole new set of bolts that will extend from the bottom plate to the top plate, through 13-14 courses of logs. In retrospect I should have used a coupling nut and continued the same bolts to the top of the walls. Instead I had to route a space for the bearing plate washer and nut below the first log. Once the plates were down, we needed to ensure that the holes in the successive courses of logs wouldn’t migrate toward the interior or exterior of the walls. For each bolt, I measured the distance from the interior edge of the plate to the center of the bolt. I made tags out of Tyvek scraps and wrote those measurements on them. Then I stapled the tags to the plates, aligned with the bolts. Why measure from the interior? As the walls rise, I'll read these tags from the interior, so it makes sense to me that the measurements would be from that side. I also tagged the locations of all vertical wire chases that would be bored through each log. Together these tags became an important part of a system of measuring and drilling every log.